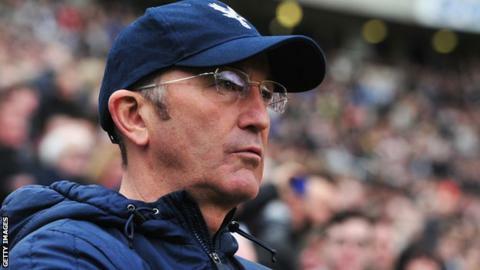 Crystal Palace manager Tony Pulis says he wants Premier League relegation rivals Cardiff to stay up. The Eagles are two places and five points above the Bluebirds in 16th in the Premier League. The Welshman says despite his best wishes the club he used to watch as a boy can expect no favours from Palace when they meet on Saturday. "I hope along with us that they stay in the Premiership but they'll be getting nothing from us on Saturday," he said. Only Cardiff have picked up fewer points away from home in the top flight than Crystal Palace this season. Pulis admits following up his side's impressive win against title hopefuls Chelsea, could go a long way to help securing their Premier League status. "By winning the game it's a great fillip for us," said Pulis. Current Eagles: Joe Ledley, Danny Gabbidon and Cameron Jerome have all played for the Bluebirds. Palace's sporting director Iain Moody was Cardiff's former head of recruitment. "But Cardiff will be looking at it the same way. They'll be looking and thinking well if we can win then we claw Palace back into it." "You look at them and they [Cardiff] have got some very, very good players and we know it will be a tough, tough game." Pulis admits he has a soft spot for Cardiff having watched them in his youth. "I watched Cardiff when I was a young boy," he said. "I watched Newport when I could get to Newport and if I didn't have games on a Saturday, if I wasn't playing for the YMCA down Pill, then I'd jump on a train and if we could then we'd try and watch Cardiff. "That was when [John] Toshack was playing, Ian Gibson in midfield. They had a really good team then. "My dad took me to watch Cardiff on a Tuesday or Wednesday evening to watch Real Madrid when there was 40-50,000 people there or whatever it was. "Last season it was wonderful to see Cardiff get promoted to join Swansea. "I was disappointed obviously Wrexham couldn't get promoted into the league but it was lovely to see my home town Newport to get promoted back into the league. "I want it [Welsh football] to thrive. I think it's important for the nation that sport in Wales in general thrives."